Do you want to begin growing strawberries? Have you been growing strawberries for a long time and simply want to get fresh ideas or helpful suggestions? You’ve landed in the right spot! This site will teach you how to grow strawberries and get you growing strawberry plants in places you would have never dreamed possible. We are passionate about everything related to strawberries here. We hope that passion shines through. Since the little and beautiful red berries are nutritious and delicious, we want to see more people develop a love for growing strawberry plants and eating the delicious and sweet strawberries they produce! In each garden strawberries have a place, and we want to help more gardeners find successful ways to incorporate them. To help you navigate to the information that is most helpful for your present situation, use this handy-dandy table of contents to go directly to the information you need. If you want to start at the very beginning and work your way through, just scroll down! This main Growing Strawberries page serves as a hub for everything related to growing strawberry plants. The basics will be covered here. The information on this page should be sufficient to give any beginner the basics needed to be a successful strawberry gardener. However, when it comes to understanding how to grow strawberries, there is a never-ending wealth of information that can be assimilated for maximum production, aesthetics, and capacity in any garden. So, while the basics of growing strawberries will be contained on this page, there will be regularly updated links to more pages on this site at the bottom that go into more detail about different methods and aspects of growing strawberry plants and how to grow strawberries using different methods. Be sure to take advantage of the links and resources as you grow strawberries in your own garden, whether it is for the home or for business. Why Should You Consider Growing Strawberries? Strawberries are the most popular small fruit grown in home gardens for good reason. Few things bring back summer memories like sinking teeth into a fresh and juicy strawberry. Why not have these sweet berries growing in your own garden? They are able to be grown in all the temperate regions of the world! Strawberries are relatively easy to grow, and they can fit within small space constraints or fill huge garden plots. Growing strawberries doesn’t require any specialized equipment. And, they can even be grown in a container or pot on a deck, porch, patio, or balcony. One of the biggest benefits of growing strawberries is their perennial nature. You can reap the rewards of your labor for several years after initially planting strawberries with minimal effort after the initial planting year. With proper care, it is not uncommon for each strawberry plant to produce a full quart of strawberries. Approximately twenty-five strawberry plants should adequately supply a normal family with delicious strawberries. Perhaps an even more important reason you should consider growing strawberries in your own garden is what you often buy along with the strawberries in stores. You buy pesticides. Commercial strawberries repeatedly rank very poorly on list of most-contaminated produce items (the Environmental Working Group’s data). This rank gains them membership in the infamous “Dirty Dozen” club. Even after washing, store-bought strawberries often have residual pesticides on or in them. Growing strawberries in your own garden allows you to know exactly what you are eating! In fact, here are 10 reasons you should consider growing your own strawberries. Once you have decided to begin growing strawberries, you need to pick your starting point. You can grow strawberries from seeds, or you can opt to transplant or purchase strawberry plants for your garden. It is more difficult if you start with strawberry seeds instead of existing strawberry plants. The Strawberry Seeds page will guide you through the delicate process of sprouting strawberry seeds and give you all the information you could possibly desire about strawberry seeds and where to find them. The Strawberry Plants for Sale page will point you in the right direction if you want to begin growing strawberries by purchasing existing plants. Whether you start with seed or plant, successful fruit production comes from successfully growing strawberry plants. All the factors and considerations needed for growing strawberries are: choosing your strawberry variety, selecting your planting site, deciding on a planting system, preparing your chosen planting site, planting the strawberry plants, creating a favorable environment, caring for the growing strawberries, harvesting the berries, renovating the berry beds, and preserving the strawberry plants throughout the dormant months. The information below will cover everything you need to know to grow your own strawberries. Although the information is general, you should be able to apply it to any specific situation and find success. Before you begin growing strawberries in your garden, you need to determine which variety of strawberry plant you want to grow. To gain deeper understanding of the types of strawberries and varieties of strawberries available to choose from, see our Strawberry Varieties page. There are three main types of strawberries: June-bearing, everbearing, and day-neutral. Some people consider everbearing and day-neutral varieties to be the same thing, but they are actually different. For a full discussion of each, see the Strawberry Varieties reference page. In short, June-bearers have the largest fruit but only produce one big crop over a week or two. Everbearers produce a larger early crop, smaller late crop, and a few berries in between, while day-neutrals produce throughout the growing season. Everbearers and day-neutrals typically produce less and smaller berries overall than do the June-bearing varieties. Considering these characteristics will determine which type is right for you. If you want fresh berries throughout the year and don’t mind picking smaller and fewer, go with a day-neutral or everbearing variety. If you want sheer quantity of berries, go with a June-bearer (what most people do). Considerations on how you plan to use your strawberries also come into play when determining which type to buy and plant. If you want to can or preserve your harvest, it is easiest to accomplish your goals with the larger size and quantity that come from June-bearing strawberries. Not all strawberry varieties are created equally. Strawberries are temperate by nature and can be finicky as to what makes them happy. So, thanks to decades of dedicated breeding programs, scores of specialized strawberry varieties have been developed and released. The most generally-adapted cultivars have become quite popular, but the popular varieties might not be the best choice for your location. To help you find which variety is suitable for your state/location, I have gathered the recommendations by state Extensions and compiled them in one place. To be sure you get an appropriate variety, check the recommended varieties for your area and choose one suitable to your locale. By choosing multiple strawberry varieties with different production peaks, it is possible to extend the strawberry season to about a full month for the June-bearing plants, which tend to produce the biggest strawberries. And, if you have garden space, you might want to consider growing some novelty or specialty strawberries. Pineberries are the latest to spark wide-spread interest due to their white color, red seeds, and pineapple taste. Also, this season is also expected to be the first prominent one for the brand-new Purple Strawberries (not-GMO). And, absolutely no strawberry variety tops the classic and diminutive Alpine varieties for sheer taste and aroma for specialty and gourmet recipes. The possibilities are almost endless! If you are completely at a loss for where to start, you can always call your local Cooperative Extension and ask them for recommendations. They can give you more specific information on which strawberries grow well in your area. As new and improved strawberry cultivars are also introduced each year, your Cooperative Extension can also clue you in to any new developments or local suppliers where you can find a good cultivar for your area. Or, if you don’t want to call your state extension, you can review state by state recommendations here: Recommended Strawberry Varieties by State. Another factor to consider when picking a strawberry plant variety is susceptibility to Verticillium fungus. This fungus causes the most common strawberry disease, Verticillium wilt (or Verticillium rot), which will end fruit production by killing growing strawberries. Since there is no practical way to kill the fungus once infection sets in, this prevalent disease is best prevented by obtaining and planting strawberry plant varieties that are certified to be resistant to Verticillium wilt. Once you settle on growing a strawberry plant variety, you need to get your plants. There are numerous catalogs and nurseries from which you can buy certified, healthy plants. With the proliferation of online suppliers, getting specific strawberry plants to grow has never been easier! Part of learning how to grow strawberries is picking the right amount of plants to begin your patch. Thinking through your goals and planned uses for your berries will guide your ordering/buying. If you buy too many, you might be overwhelmed. If you buy too few, you might be frustrated with the lack of berries when you need them. Before you order, be sure to think about and study up on what you are going to need. These resources should give you the information you need: How Many Strawberry Plants per Person, How Many Strawberries do Strawberry Plants Produce, and Strawberries per Day. Once you have settled on the type, variety, and quantity of strawberry plants, all that is left is to get the best possible deal on plants. We’ve made it as easy for you as it can possibly be. Just go to the Buy Strawberry Plants or Buy Strawberry Seeds page, find the variety you would like to order and take a look at the listed stores to see which one offers you the best deal. If you’d rather buy from a bricks-and-mortar establishment or nursery, see our directory of local Strawberry Nurseries. Choosing an area conducive to growing strawberries is a critical step in learning how to grow strawberries. There are several factors that need to be considered when selecting a site for your strawberry garden. First, strawberries love sunlight and need full sun to produce the largest yields. While harvestable berries will be produced with as little as six hours of direct sun a day, it is best to select a site that is clear of other tall or shadow-casting trees or plants. Planting strawberries away from large trees is important so that the tree root system doesn’t compete with and siphon away needed moisture from the growing strawberry plants. Second, there are several soil issues that should be addressed. While they are able to be grown in most soil conditions, strawberries prefer a sandy loam that is deep and contains very high amounts of organic matter. Extra compost, peat moss, and some sand or grit can be added to your selected site to create the best environment for growing strawberries. Potting soils usually have sufficient compositions if you are planning on planting strawberries in a container. In that case, add an extra inch or two of fresh compost to the surface of the potting mix. The history of the dirt patch is also important to your success in growing strawberries. If other Verticillium-susceptible crops have been grown in the same area during the last three years, it is best to choose a different site. The most common of these plants are tomatoes, potatoes, eggplant, peppers, and strawberries. If these plants (or melons, okra, mint, bush or bramble fruits, stone fruits, chrysanthemums, and roses) have been grown in the same spot recently (within 5 years), it is best to grow your strawberry plants elsewhere. Third, it is important to pick a site that has good soil drainage and surface drainage. Although strawberry plants need constant moisture to thrive, the plants will rot if left in standing water due to poor site drainage. If you only have access to a site that has poor drainage or heavy soils, constructing a raised bed for the strawberry plants should facilitate better drainage. The strawberry bed should be elevated, at minimum, six to eight inches. Also, make sure there are drainage holes in the bottom if you are using container gardening methods. Strawberries do not perform well in drought conditions either. Therefore, be sure to select a site that will allow easy access so that it can be watered if rainfall is not adequate. When growing strawberries, it is important to keep in mind that they are traditionally grown as perennials. So, even though some varieties can be grown as annuals in the hotter parts of the south, better results are usually obtained when the strawberry plants are planted in one year and nurtured for bigger yields in subsequent years. Various planting systems are used for growing strawberries depending on which type you plant. As discussed in the Strawberry Varieties page, the three types of strawberries are June-bearing strawberries, ever-bearing strawberries, and day-neutral strawberries. June bearing strawberry plants are most often planted using the matted row system while day neutral strawberry plants and ever-bearing strawberry plants are usually planted in a hill system (also called the mound or mounding system). These two systems usually yield the best crops. 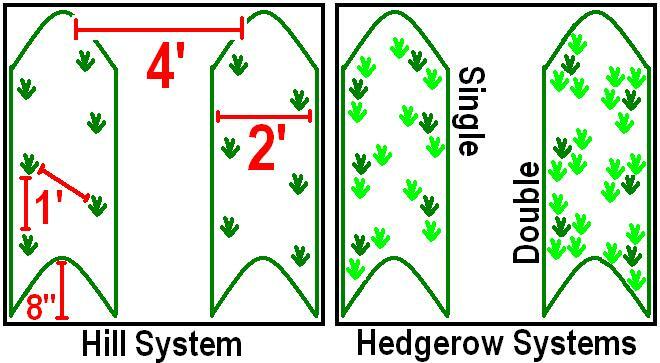 However, spaced row systems, single hedgerow systems, and double hedgerow systems are also used. The matted row system for growing strawberries is most commonly used for June bearing varieties, and it works well for any cultivar that sends out a lot of runners. To grow strawberries with this system, set plants about 24 inches apart (18 to 30 inches is acceptable) in rows about 4 feet apart. Allow runners to spread freely and root at will within the row to form a crisscrossed, matted row about 24 inches wide. The hill system for growing strawberries is most commonly used for day neutral strawberries and everbearing strawberries. To grow strawberries with this system, you start with a mounded “hill” of soil about 8 inches high and 24 inches across. Extend this mound into a row as long as you like. Set two rows of plants per hill in a staggered pattern with each plant being 12 inches from the other plants. Multiple rows are spaced 4 feet apart. All runners are removed from every strawberry plant in the hill system as soon as they are identified. Removing the runners causes all the productive capacity of the mother plants to remain with the mother plants. This energy will result in additional lateral crowns adjacent to the original crown and more flower stalks for fruiting. The hill system is often preferred by the home gardener because it results in a higher quantity of higher quality berries (fancier, larger, better for selling at farmers’ markets), while the matted row system usually produces a higher total number of strawberries. There are two modified versions of the hill system: the single hedgerow and the double hedgerow (also called the spaced-row system). These systems are the same as the hill system except that some runners are permitted. In the single hedgerow system, each strawberry plant is allowed to root two additional runner plants. The double hedgerow permits several runners to root. All runner plants in this system should be spaced at least 4 inches away from other plants (5 to 7 inches is better). Once you have decided where you will be growing strawberries, you need to prepare your garden for planting strawberries. If your site is sod-covered, it is best to cultivate and till the area the year before you want to plant your strawberries to eliminate competing grasses. When possible, it is best to grow a green manure crop the year before you want to begin growing strawberries to improve soil quality (oats, sudan grass, and rye are all excellent for this). When you are ready to plant your berry plants, you should, to the best of your ability, ensure that the site is free of weeds, grubs, and any soil-bourne diseases. Once any sod or grass is gone, work two to three inches of compost into the top layer of soil. Add more organic material before planting, especially if the soil doesn’t retain moisture very well. Peat, compost, or aged straw and manure are good options. Additionally, organic or inorganic fertilizer can further improve soil quality by being worked in down to six inches. The pH of your site’s soil is also important for growing strawberries. In order to grow strawberries most effectively, the soil needs to be slightly acidic. Strawberry plants will grow in dirt that has a pH between 5.0 and 7.0, but 5.8 to 6.2 is ideal for maximum growth and production. Soil test kits are available online and through garden supply stores. However, the best results are obtained through the professional soil testing services provided by your county’s agricultural extension agent. Before planting strawberries, you should test your soil and amend it as indicated to create the best possible environment for growing strawberries. Common amendments are lime and manure. If test results show that lime is needed, it should be applied prior to planting the strawberry plants and tilled in thoroughly with the soil. Compost or aged manure from cows or horses is also added, usually at a rate of 2 to 5 bushels per 100 square feet. Learning how and when to properly plant strawberries is an important step in learning how to grow strawberries. Fortunately, it is fairly easy! This guide is tailored to the typical home gardener who plants an entire garden, including strawberry plants, in the spring. For gardeners who don’t mind planning a bit, planting fall strawberry plants can be a better option if harvesting during the first growing season is important! For spring planting, as soon as the soil is dry and able to be worked (usually March or April), you should plant your strawberries. The plants need to be well-established before the temperatures rise in the summer months. When you are ready, loosen and pulverize the dirt down six to eight inches, and keep it loose to allow runners to take hold and roots to establish. You should have disease-free, healthy plants ready to plant. If picking them yourself, choose plants that have large crowns with healthy, light-colored roots. If you ordered them, open the package immediately and inspect them. If moldy, send the strawberry plants directly back. If you can’t plant them immediately, wrap the strawberry plants in wet paper towels, put them in a bag, and store them in your refrigerator until you can plant strawberry plants outside. Planting strawberry plants should be done on a cloudy or overcast day or during the late afternoon. How to plant strawberries: dig out a hole big enough to spread out the roots of each strawberry plant. In the bottom of the hole, create a mound or hill of soil that is flush with the surrounding soil level. Put the strawberry plant on top of the hill inside the hole so that the crown is at soil level and spread the roots out down the sides of the hill. Fill in the hole and ensure that the soil level is even with the middle of the crown. 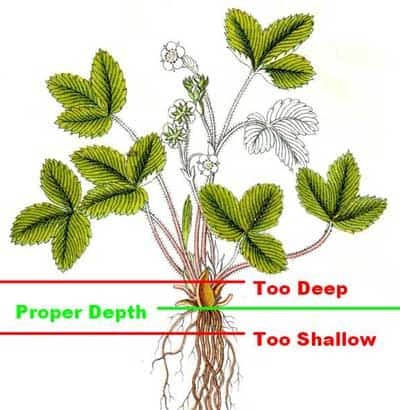 Planting too shallow may cause the roots to dry out before they establish, and planting too deep can also damage growing strawberries. See the figure below for proper crown placement. Once the plants are planted, press to firm the soil around the roots and then water thoroughly. There are two main scenarios gardeners typically encounter when deciding to order plants. They either obtain plants that are actively growing (either in pots or as plug plants), or they buy dormant bare root strawberries. The potted plants usually have a head start on the dormant plants and will grow more quickly, but they are typically significantly more expensive. For the same price as two or three potted plants, one can often obtain 20-25 bare root plants. Plug plants are in the middle of the cost spectrum, but they are still usually more expensive than the bare root strawberries. Planting each is slightly different. Here is a good video demonstration of how to plant potted plants. The video is specific to the Bonnie Plants brand, but the information would apply to any potted strawberry plant. Secondly, here is a video demonstration of how to plant bare root strawberry plants. Again, the video was produced by the Gardener’s Supply brand, but it is also representative of how to plant any bare root strawberry plant from any reputable source. Once the plants are in the ground, it is important to create an environment that is most conducive to growing strawberries. Mulching is a time-honored method for making the growing strawberries happy. After you’ve planted your strawberry plants, mulch the strawberry bed with shredded leaves, pine needles, compost, or straw. Pine needles are a good choice as they slightly raise the acidity of soil as they decompose. Mulching also keeps the soil temperature down, mitigates the weed problem, and keeps the fruit cleaner by keeping the strawberries off of the dirt. Most varieties of strawberries produce better when their roots are in cooler soil. If you have decided to grow strawberry plants, you probably don’t want to wait to reap the fruits of your labor. I don’t blame you. However, delaying gratification now can result higher quantities of strawberries later. Additionally, it is important to treat June-bearing strawberries differently than everbearing strawberries and day-neutral strawberries. All types of strawberry plants will produce better in subsequent years if all their energies are devoted to establishing themselves and producing healthy runner plants in the first year. To accomplish this requires a feat of delayed gratification. To have the strongest plants in subsequent years, you have to remove all the flower buds in year one. Without flower buds, you won’t be able to enjoy harvesting strawberries. But, you’ll get more and better berries beginning in year two. Few people do this, but most should. For June bearing varieties, you can train the runners to follow a specific pattern, or you can allow them relative freedom in a matted row system. In general, all strawberry plants will produce best when limited to a density of approximately five plants per square foot. Too many strawberry plants will have the same effect as weeds would: reduced yields of smaller strawberries. Of course, any and all weeds should be removed. For day neutral and everbearing strawberry plants, the removal of buds and runners should occur until July 1st of year one. They naturally don’t put out as many runners as June-bearers. Instead, they focus their energy on producing multiple strawberry harvests. You may end up getting a small harvest with everbearing or day-neutral varieties, depending on your climate. The main harvest will come in the second year when all mother plants and all the runners which were well-rooted before August will produce strawberries! Growing strawberry plants require a constantly moist environment, so regular watering is needed. To have the most success growing strawberries, at least an inch of water should be provided to the plants either through rainfall or direct supplemental. Up to two inches of water can be given while the fruit is forming, from early bloom until the end of harvest. Watering should continue during dry periods in August and September. This later water helps reduce stress on the strawberry plants which helps fruit bud formation in the following year. Remember, while water is critically important when growing strawberries, they do not like to sit in standing water. This is why your site needs good drainage. Strawberry plants are relatively shallow-rooted, so soggy ground can cause them to rot while dry ground can kill them or stop fruit production. Mulching helps keep the moisture level of your soil more consistent. Fertilizing helps growing strawberry plants reach their maximum potential. It can be beneficial to fertilize multiple different times in the life of a strawberry bed. First, a balanced (10-10-10) fertilizer should be added just before planting your strawberry plants. Add one to two pounds of fertilizer per 100 square feet. This helps increase the nitrogen levels in the soil. Second, during the first year of the strawberry garden, another round can be applied after the strawberries have been planted for around four to six weeks, and again in August, depending on plant growth. Third, day-neutral and everbearing strawberries can be fertilized after the first harvest. June-bearing strawberries should be fertilized during renovation. This is done to keep the plants vigorous. Be sure to water the fertilizer well to get it to soak in down to the roots of the growing strawberries. You should not fertilize your strawberry plants in the spring of a fruiting year. Too much nitrogen will result in soft, easily-damaged strawberries. You can still fertilize after the initial crop for day-neutral and everbearing strawberries, and you should also fertilize immediately after renovation once the plants are completely dry. Applying fertilizer to wet strawberry plants can result in phytotoxicity, and no fertilizer particles should remain lodged in the plants. After application, sweep your plants with a broom or other suitable tool to dislodge any stuck fertilizer. You do have to be careful when fertilizing growing strawberries. If you apply too much fertilizer, you will get excessive leaf growth and poor production of flower stalks. If you plant strawberries in colder climates, late-season fertilizing can cause new growth that will be damaged by cold-weather frosts. Indeed, I have grown strawberries without any fertilizers in less-than-optimum soil and still gotten a reasonable harvest, so it is better to fertilize too little than too much until you become experienced. If you prefer growing organic strawberries, blood meal can be used to increase nitrogen while bone meal can be used to increase phosphates. Growing organic strawberries with these organic fertilizers requires application about once per month from June through September. Humans aren’t the only creatures that like the tasty, sweet strawberries you will be growing. Birds and slugs (and other critters) love them too. Birds will inevitably get some of your strawberries. However, you can protect the vast majority of them by covering your rows with bird netting. Additionally, copper ribbon will keep the slugs away. You can read more about this and similar topics on the Strawberry Plant page. You Grow Strawberries for the Harvest! After a couple of years planting and caring for growing strawberries, you are ready for harvest! Strawberries should be completely ripened on the plant before harvesting. Most varieties should be left on the plant for one or two days after the strawberries have gained full color. Ultimately, however, you have to eat one to know if it is ready! Strawberries are somewhat fragile and are easily damaged and bruised. Gentle hands and tender care should be used when picking them from the strawberry plants. To pick a ripe strawberry, release it using the fingernails of your thumb and forefinger to sever the stem directly above the berry instead of pulling on the strawberry itself. Cradle the berry in your palm as you pick it so that it doesn’t fall and bruise or get dirty. The cap and part of the stem should still be attached to the berry. You can harvest your strawberries as often as every other day if you want to maintain ripe, high-quality fruits. Strawberries should be dry when they are picked. Wet berries do not do well and will mold quickly, and, unlike tomatoes, will not ripen after being picked. As soon as they are harvested, it is best to place unwashed strawberries in cool, dry, shady place (a refrigerator is best). For more information and a ripeness chart, see the Strawberry Picking page. Like most garden plants, strawberries produce in season. While the seasons vary, it is difficult to keep a plant producing all year (and, it is hard on the plants!). So, taking the harvest and preserving them for future use makes a lot of sense. Whether they are jammed, jellied, dried, or saved in some other form, most people love Strawberry Preserves. If you don’t have a traditional family recipe for strawberry preserves, feel free to use any of those! Or, if you prefer more Fragaria delightfulness at a lower temperature, try one of the 8 main methods of Freezing Strawberries to preserve your harvest. And, of course, be sure to use as many as you can in delicious Strawberry Recipes! Renovation is an important part of growing strawberries of the June-bearing variety in the matted row system. Since strawberry plants don’t live forever, renovating right after harvest can keep them vigorous for up to five years as new runner plants are given the chance to replace old or weakened plants. To renovate, thin the plants in the rows to about 6 inches apart (5 to 6 plants per square foot is the maximum acceptable). Then, mow the tops of the plants to one inch above the crowns. Take special care not to damage the crowns. If the foliage is disease-free, rake the leaves and compost them or incorporate them into the soil. Fertilize with a balanced (10-10-10) fertilizer. Narrow the rows to between 12 and 18 inches by hoeing or tilling. A good, aggressive renovation effort will see about half of the strawberry plants removed. After plant removal, work the mulch medium into the soil with a tiller. Since strawberries have a shallow root system, spreading a thin layer of soil (about a half inch) around the crowns can help facilitate new root development. Continue to water the plants at least 1 inch per week through September and maintain the planting as weed-free until it the first frosts. Allow early runner plants to root where they will until your desired row width is re-established. However, runners produced after September 1st will not have time to establish themselves and survive the winter, so they can be removed. Whenever you begin to notice the growing strawberries losing vigor or struggling to maintain their vitality, or if your yields begin to decrease, you may have reached the end of your strawberry bed’s lifetime. When this occurs, start over with new plants in a new area. Click this link for a detailed explanation: Strawberry Renovation. How to Grow Strawberries in the Second Year? Keep Them Alive! If you want to continue growing strawberries from year to year, you have to preserve the bed and the strawberry plants in it. In areas with relatively warmer winters, your strawberries will likely not need much additional care to survive the winter. In colder climates additional mulching is required when the temperature drops into the twenties, but before it falls to 20 degrees Fahrenheit. Strawberry blossoms, however, are easily damaged by frost and will have to be protected in the spring if frosts are predicted. For cold winters, wait until the strawberry plants go dormant. This usually happens in December when temperatures drop into the teens or low twenties and the top half inch of soil is frozen. Then, apply a mulch of straw or pine needles 2 to 3 inches thick over the bed. Other mulches that do not contain weed seeds can be substituted in a pinch, but do not use sawdust, leaves, or cut grass as they will pack too tightly and can smother the plants. Watering the mulch lightly can help prevent wind loss. Additionally, don’t apply mulch after several consecutive warm days. The mulch may spur the strawberry plants to begin growing again which will result in extensive temperature damage and even plant loss. In the spring, rake the mulch off to the side so that the plants can begin growing again. However, keep it handy so that the plants can be re-covered when frosts are predicted. Old blankets or cloths or commercial materials like Reemay can be use to mitigate the threat of frosts as well. Leave the mulch around the base of the plants to keep the berries off the ground also. Strawberries are one of the most rewarding food crops to grow in a small home garden. Homegrown berries taste far better than the store-bought ones and you can save some serious money by not having to pay supermarket prices. Be sure to check back often for updated articles on the various aspects of successfully growing strawberries in different environments and with different methods! Have you tried growing strawberries in containers or pots before and found only failure? Growing strawberries in containers can be frustrating, but it doesn’t have to be. Follow these 6 tips and your container strawberries will produce like champs! What causes small strawberries? The most common causes of small strawberries are discussed here. The first step to fix a problem is knowing what the root causes are. Strawberry pollination is not very difficult. However, pollinating strawberries has some surprising benefits. Learn why and how to pollinate strawberries. The benefits are multitudinous! This guide will help you learn how to grow certified organic strawberries. The regulations can be cumbersome when you decide you want to grow organic strawberry plants. Help is here! If you want to find success growing organic strawberries, these 4 secrets will help you grow organic strawberry plants with maximum efficiency and highest yield! Fall is the best time to plant strawberries for several reasons. The most important, however, is so that you do not have to pinch or snip the flowers off of your spring-planted strawberries. Yay for 1st-year harvests! Do you have wilting strawberry plants? Why do strawberry plants wilt? If you want to know what causes strawberries to wilt and what causes wilting strawberries, be sure to review the information in this post. This step-by-step guide is about mulching strawberry plants with straw for winter. Take these steps to mulching your strawberry bed and see your strawberry plants safely through the cold. Want to know how to overwinter strawberries in containers? Overwintering strawberry plants doesn’t need to be hard or confusing. Learn everything you need to know about overwintering strawberries here. Learn about newborn strawberry plants here: planting strawberry seedlings, handling strawberry seedlings, hardening strawberry seedlings, and everything about the strawberry seedling! Want to grow strawberries from those upside-down hanging planter thingies? Read this first to see if you should utilize these strawberry planters. Find out all you need to know about the quantities of strawberries you can expect to harvest: by plant, by row foot, or by acre. Use this info to plan ahead for your needs! Use this strawberry planting guide when planting strawberries to know exactly when to plant strawberry plants in your area. Date ranges for zones 3 through 10 provided here. Learn about companion planting strawberries and which companion plants work well for strawberry plants. Lots of information on strawberry companion plants and companion planting is here. 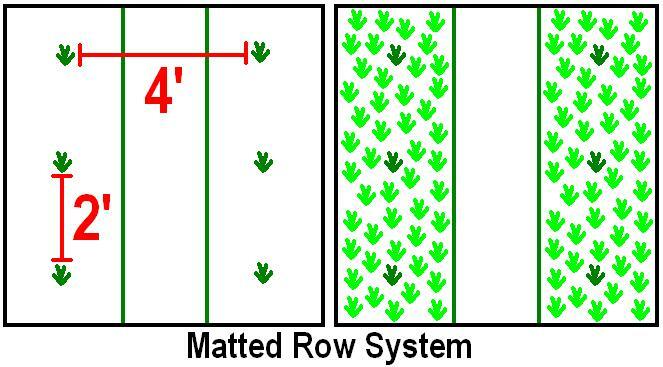 The matted row system has been used successfully for decades. The matted row strawberry system makes growing matted row strawberries easy for the home gardener and hobby gardener alike. A guide to traditional strawberry renovation. Get help here with renovating strawberries & renovating strawberry plants. While growing organic strawberries is the wave of the future, this information is still useful. Wondering how many strawberry plants per acre need to be planted for commercial strawberry farms? Look no further. Get the approximate number of strawberry plants per acre of land with this table. Growing strawberry plants commercially can be profitable. But, commercial strawberry growing isn’t easy. Read this before trying to grow strawberries commercially. With strawberry plants and cold injury threat events, checking strawberry plants for cold damage is needed. Dormant strawberry plants revive with warmer weather and can get damaged when temperatures drop. Here’s how to do it. Strawberry Plants Producing Runners but no Strawberries? Few things are as frustrating as seeing strawberry plants grow well and then be stingy with the strawberries. No strawberries on strawberry plants is a very sad sight. Here is how to fix strawberry plants producing runners but no strawberries. Companion planting strawberries with borage is a good idea. Borage and strawberry plants help each other be the best strawberries and borage they can be! This article gives the details. Grow your own strawberry plants? Absolutely! Growing your own strawberries is a great idea. Here are 10 reason why you should be growing your own strawberries. Each strawberry flower turns into a strawberry. Here we discuss where strawberry flowers come from, strawberry flower care, & other info on strawberry flowers. This growing strawberries guide is a great monthly strawberry growing overview. It covers the main tasks that need to be attended to each month and season. Everything about mowing strawberries is here. Mowing strawberry plants helps them thrive. Learn how to mow strawberry plants; it sure beats pruning strawberries! Ever wonder when to transplant strawberry plants? Transplanting strawberries is not too hard. Here is how you should go about transplanting strawberry plants. Strawberry plant propagation doesn’t have to be hard. There are three main ways to propagate strawberry plants. One is the easy way to propagate strawberries. Ever wonder how a new variety of strawberry plants is developed? Find out here. Learn how to develop a new variety of strawberry plant. New strawberries, yummy! What are strawberry runners? The details of strawberry plant runners are here. Find out the benefits, drawbacks, & usefulness of runners on a strawberry plant. I live in switzerland and started growing strawberries last year. Last year we had nice big strawberries. this year we are getting very tiny strawberries on most of the plants. What could be the reason and how can this be addressed? Likely, one of these reasons is the culprit. Good luck! I planted several strawberry plants and mulched the bed to suppress weeds and conserve moisture. But I am confused as to what to do with my runners? How will they root when they run on top of the straw? Should I make a hole for the runners in the straw so they can reach the soil? They will have difficulty rooting if the straw is thick. It is best to make a small hole so that the adventitious root at the bottom of each node along the runner can come in contact with the soil. Once the root touches soil, it will grow down into it and establish itself independently of the mother plant. Good luck! I planted a strawberry tree in a pot for more than four years. In the first year, the tree had lots of leaves but during the second year it started to lose its leaves. Since last year, the tree does not have any leaves so I replaced the pot with a bigger one and added more soil. It’s been two weeks now and the tree did not produce any leaves. Is there any way to help the tree to produce leaves or does this mean that the tree is dead? Although strawberry trees are completely different than the traditional strawberry plant (and, therefore, I don’t know how to best answer your question), it sounds like the plant you reference may have given up the ghost. Sorry! My container strawberries are on their second year now. My ever-bearing plants died over the winter, but the June-bearing have bounced back very well. They are starting to get fruit on them now, but I have noticed the strawberries look somewhat malformed, not perfect like the ones you see in grocery stores. They are growing to full size though, but they just look a bit deformed. What would cause this? Also, I don’t seem to be getting as many blossoms as expected. How can I ensure I get more blossoms (strawberries)? This information on deformed strawberries might help. Good luck! I have a single bare-root strawberry plant and was wondering if it will produce fruit without another plant to cross-pollinate with. Thank you for any advice! It may produce some, but it will definitely be more likely to produce larger and more berries with adequate pollination. Good luck! Hello, can you plant different types of strawberries beside each other? Will they cross polinate? I want to plant some berries in rain gutters along the side of the house. 4 rows about 40 foot long. Would like different types in each gutter. I got some blue and purple and black strawberry seeds to plant. And would like early glow and honeye plants. What are your thoughts about different ones near each other. You can plant different strawberry varieties beside each other without any problems. However, as for the different colored ones for which you purchased the seeds, you might want to review this. Good luck! I am from Punjab(India) at here temp reaches upto 40-45C in summer which is from may to September and in months December to Feb it drops to some times upto 10 degrees. can strawberries survive these temp conditions and the raining season is July to sept. and January to march.I am thinking of Farming berries on large scale if it is possible than which variety of strawberries should i chose. Unfortunately, strawberry plants are unlikely to survive the heat there. Very sorry! I grew 3 varieties of strawberry in a very large pot on my patio last year. It was my first year growing them. The plants grew like crazy and were very healthy. I live in a townhome, so I was not able to bring the plant indoors, and I don’t have a shed or garage, so the plants have been sitting in this large pot on my patio all winter long. We had alot of snow this year, and several times the plants were buried under snow. I have been worried the winter weather would kill them, but I have had alot of people tell me not to worry, that the plants will be back this year. Spring is rolling in now, and there are alot of dead, dried up looking leaves/stems in the pot, but there are also alot of green leaves among them. My question for you is, should I clip out all of the dead leaves and branches that are covering the soil? Or should I wait til the last frost to do this, to protect the plants? Or should I just leave the plant alone and let it do it’s thing??? You should go ahead and remove the dead vegetative matter. It can harbor fungi and other things that can menace your plants as the weather warms. Good luck! The information of this page should help me to i have get a good garden in the Babolsar of Iran. I’m glad it helped! Good luck! Hello! I’m from the Philippines, and it’s been two months now that I planted my strawberry seeds that I bought from the super market, and they are growing.. any suggestion on how to keep them healthy and keep them away from any pesticide? do I have to spray anything? The information on this page should help you sufficiently. Especially, pay attention to the links at the top. Good luck! The plants will likely do the best with no more than 3 per square foot of soil space. But, other than that, they should do fine in containers as long as they are watered and cared for appropriately. I wouldn’t mow them just after planting, however. Good luck! I started 4 raised beds 8 x 4 each with 25 June bearing plants. I live in WI. I kept the runners in the beds all summer and now the plants have completely filled the beds and runners are hanging over the edge again. I’ve read the sites about transplanting,etc. and it sounds like I shouldn’t thin the beds until after they bear fruit next year???? They started as crowns this Spring. I don’t know if I should cut off the runners and if berries will produce with the beds this full. Please help! Fall is a great time to transplant. See if this page helps. If the runners are just running over the edge, and you have no intentions of planting or saving them, just snip them off. Also, it is ok to thin them if they are too dense. Good luck! First off, Thank You for what you do here. 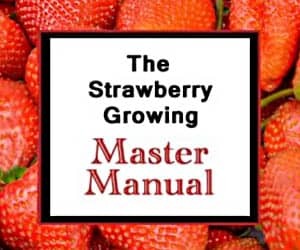 I admit I am only a beginner at raising strawberries, however, this forum sure makes it a much easier task due to your patience and vast knowledge. Just to set the scenario….. I planted some everbearers that I purchased from a nursery,in the late spring(mid-june)in a raised bed that I put together consisting of a combination of peat moss, steer manure, potting soil, gardeners top soil, and some of the natural existing clayish soil. The combination amounted to about 5″ altogether and this was all on top of the already existing clayish soil. Drainage is good due to a point, but then at about 3″ to 4″ depth, the soil stays fairly damp causing me to be concerned about root damage. Most likely the compactness of the clay soil which this patch was built upon is restricting drainage so I have been watering daily but allowing only about 1″ of the soil to be wet. Now to my question. Here in Montana we are having a 3 to 4 day raining event which is supposed to dump 2″ to 3″ of moisture on us(at time of this writing we have received a half inch),so what do I do? Build a plastic tent to repel this water or just sit back and hope for the best? Thank You in advance for your advice on this. Too much water can indeed pose a problem. Most of the strawberry roots are actually in the top 3 or so inches of soil, so you may be fine without going to the trouble of erecting a shelter for your plants. Just make sure that they are mulched well so that dirt from the ground doesn’t splash up onto the leaves/plants. That is a primary way that fungal diseases are spread to strawberries. Good luck! hi , im ngal from the philippines .. i have bought strawberries from a store and decided to plant the seeds. i’ve already done it but i’m quite doubtful if it’ll live in such tropical country.. we have an average temperature of 36C high .. Unfortunately, strawberries are temperate by nature and do not do well in tropical environments! Sorry! The wilt did stop and I let the plants dry a bit. It looks like they are now getting a fungal infection! I am learning how to take care of that as well. Oh no! It can take some time to get the hang of helping healthy strawberry plants reach their full potential! Good luck! i am a cambodia people,I leave in phnom penh city.I want to ask you about strawberry,can i plant in cambodia or not and why? Cambodia is not a good place to try and grow strawberries due to the climate. Strawberries are temperate and would need a controlled environment to do well there. Very sorry! I’ve been growing strawberries in containers for a couple of years now and I’ve noticed that the crowns and roots of the plants are raising themselves out of the soil, causing the exposed portions of the roots to dry out. The plants seem happy enough for now, but I was wondering it would be preferable if I repotted the plants every year so as to ‘earth up’ the strawberry plants and their roots. I suspect that earthing up is par for the course for in-ground perenial strawberry patches, but it’s rather impractical in container culture short of either repotted or leaving a substantial void in the top of the container for mulching/earthingup over the 3-4 year life of the plants. My concern with repotted is that risturbing the established root system might be far more detrimental than simply leaving the plants in situ. Many varieties of strawberries will expand at the crown. This is fine. As the crowns expand, the central roots become more dense. As that happens, some peripheral roots will be exposed and die off. That should not significantly decrease plant production or growth unless the exposed roots are due to significant erosion. So, you should be able to leave the plants alone. Hope that helps! Good luck! Thank you for your comprehensive site. I don’t know what type of strawberry plants I have so I’m not sure whether to keep the runners or not. Any advice? If you like the berries and want more plants, keep the runners. If you don’t, don’t keep them! They might have too much water. Often, water can pool on top of clay-heavy soils and promote fungal growth or other pathogens to proliferate. It is better to mulch with straw than to mulch with dead plant matter, as such a mulch often harbors pests or fungi. This might be of use: wilting strawberries. Good luck! I would like to use an old tractor tire so please tell me how deep to I have to have the dirt and can you use plastic under the tire to help keep the weeds from grown up through the strawberries . An old tractor tire should work fabulously well for growing strawberries, so go right ahead. You can use plastic under the tire to prevent/minimize weeds, but be sure water can still easily drain out. Strawberries do need well-drained soil because water-saturated or puddled soil will harbor fungus which can kill, contribute to rot (which also induces the plants’ demise), and can cause wilting in less-severe circumstances. So, go for it and good luck! The farms that sell thousands of plants, how do they start them? Seeds…propagation? They start them several different ways. See here: strawberry propagation. Also, watch the last video here to see how they are planted commercially: Growing Commercial Strawberries. Hope that helps! 6 year kld strawberry patch has fizzled out. Can I use the remainder of plants to re-plant a new garden? If there are some plants still putting out runners, you can. Just follow the instructions here: Transplanting Strawberry Plants. Good luck! I am very interested in growing the June-bearing strawberries. I am not sure if they are planted for just 1 bearing season or are the plants kept to grow and bear fruits for some more years? Looking forward to your reply. You can do either. If you are planning on growing strawberries on a large strawberry farm, most strawberry farms treat them as annuals and replant yearly. If you are going to grow them at home, most home gardeners treat them as perennials. In a home garden, with appropriate care, strawberries will produce for 3-4 years. Good luck! Thanks for the update! Unfortunately, I am not sure what you can do differently with your hydroponic setup. Help, I just got my flat of plugs and I can’t find here an ‘unpacking for dummies’. only that I should wrap them in damp paper towels if not planting right away. I’m not going to be ready to plant for about 3-4 days, the plugs got banged up a little by ups, burt look decent. Were not shipped in plastic, just in a box from a high quality nursery using healthy stock. I sprayed the leaves with rainwater they are a bit dry, but the soil in the plugs didn’t dry out, I would like to rwmove some leaves but don’t want to stress the plants. It’s 85 F for the highs and Florida humidity, so I put them in the garage tonight open to the 70’s evening and night air as they arrived in the nursery plugs flat. What is the best way to procede to hold these for 3-4 days and if that turns into a week will it be a problem? The roots will have to be soaked for transplanting into an inert medium, not to be grown in soil. The most critical thing is to keep the roots moist. It is best if they aren’t extensively exposed to air as well. If you have to keep them out of the ground, wrapping the roots in damp paper towels is the easiest way to accomplish that. The leaves aren’t as essential as the crown and root system are. If you are growing them in a hydroponic system, just try to get them planted and situated as soon as possible. Good luck!